An itchy skin is not what you hoped for when dyeing your hair. It is in fact the worst thing you dread. Allergies related to hair dye are not very common, but existent. How do you know you are having an allergic reaction to the hair dye? Your skin and face may start to swell up. You may have difficulty breathing. Most people may feel extremely itchy after applying hair dye. There are various causes that would lead to the reaction and the reaction would affect you to as far as the face. There is a likelihood that the reaction would be heightened during pregnancy. Let’s look at some of the symptoms, causes, treatments and how long the allergy would take on your skin. How long does the reaction last? 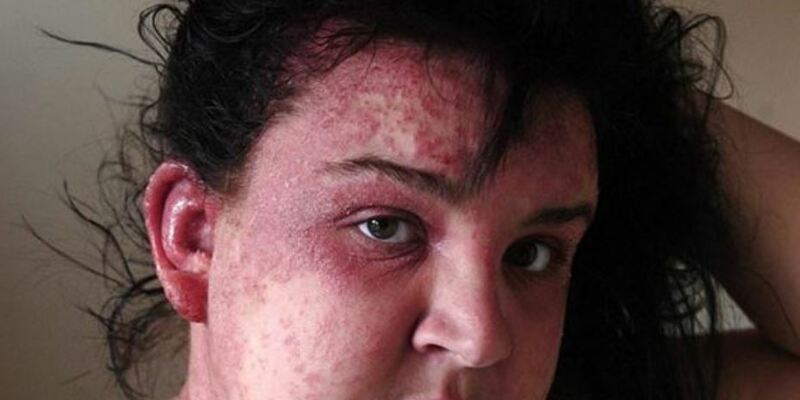 Vulnerability to skin reaction is known in medical terms as contact dermatitis. In this regard, the skin becomes swollen, red, dry. It then gets irritated when you get in touch or in contact with a trigger. In this case, the allergen is the hair coloring agents. There is scientific evidence that most of the hair dyes have the substance called paraphenylenediamine abbreviated as PPD. This is a permanent and semi-permanent hair dye. There are high chances that your risk of getting the reaction are high when you have temporary tattoos or openings on your skin. The reason for this is because the product makes your skin sensitive and therefore it begins to react in defense. Note that hair dyes that contain PPD are safe to use if you follow the safety instructions printed on the label. However, allergic reactions to PPD are common due to people dyeing hair at home. Hair dyes can give you scalp inflammation and swelling on the scalp. The signs can be mild to severe especially on your scalp, neck, forehead, ears and the eyelids. The areas get irritated and swollen immediately after you have used the dye. The areas become red, thickened, dry and then crack. Afterwards, you will have some burning and stinging sensations. The symptoms of the reaction would take place in a period of between 36 to 48 hours. There are other cases when there is an immediate reaction in the event that you use strong doses of the irritants and product. A severe reaction is known as anaphylaxis. Apart from that, urticaria is yet another symptom. In this case, you will experience a lot of red patches on your body and red skin. This condition occurs when the chemical reactions make blood to start leaking into your skin. There is also a likelihood that you will get an anaphylactic shock in which you will start having some swelling on your face, a drop in your blood pressure, shortness of breath which could at times lead to death. In this scenario, you ought to look for medical attention as soon as possible before the situation gets worse off. On overall scale, the allergic reaction due to the hair dye tends to burn your skin more, be more painful than give you an itching sensation. What does the allergy look like? Is it a reaction from hair dye or something else? Here are pictures to help you identify the symptoms. There is evidence that hair dyes are safe for use in pregnant women as they are less toxic. This is because there are only small amounts of the PPD that are absorbed by the skin and hence little would be available to affect the fetus. However, during pregnancy, you are likely to get heightened degree of allergic reactions (inflammation) as a result of the hair dye. During this time, your body pumps up so many hormones and thus any changes in your environment could lead to an allergic reaction. The allergy may be mild and in other cases very serious and severe. In most cases, the reactions are not as dangerous and as a result heal on their own without need for any medication or remedies. However, you should consult your doctor immediately when you notice itchiness and a lot of burning sensation. You should never bleach your eyelashes or the eyebrows as they are likely to swell and put you at risk of infections of the eyes. Ensure that the hair is well ventilated when you have dyed your hair so as to allow proper circulation around the area. The reaction is likely to get complicated and this would call for an alternative remedy. For instance, there are cases where the reaction would take as long as 6 weeks. Taking the right precautions will help stop and prevent the side effects of dye and PPD. Here are preventive tips you should consider to avoid getting a bad reaction in the salon or at home. Always do a PPD patch test. This will help you determine if you will get a reaction or not. Do this for both permanent and semi-permanent hair dyes. Do not leave the color on your hair for too long. Only use as instructed. Always wash and rinse your scalp thoroughly to avoid remnants of chemical color on your skin. Always choose hypoallergnic hair dyes if you have a sensitive skin. Use a mild shampoo to thoroughly wash your hair to remove any dye that has accumulated. After that, apply 2% of hydrogen peroxide solution. In the event that your scalp feels tight, then go ahead and apply some cold olive oil. These are useful when your skin is red, swollen. Topical application of the cream would give some relief to the symptoms. If the cream does not alleviate the symptoms, then contact your dermatologist and pharmacist for an alternative. The juice has antiseptic and astringent properties. What you ought to do is get the juice and then mix it with some water then apply to the area that is affected in slow soothing, massage motions. More to that, you can mix the juice with some yoghurt so as to effectively treat the allergies. This is useful to reduce some of the irritation that comes about. What you have to is mix some water with the baking soda. After that, massage the paste to your scalp then give it about 15 minutes. When you are done with that, rinse the scalp with some water. It has some anti-inflammatory properties that would be very essential in getting rid of the swelling that are brought about by the allergy of your scalp skin to hair dye. To add on that, it helps to minimize the itchiness that mostly occur on such a scalp. Hot water provides a numbing and cooling effect to your irritated skin. Further, it helps to wash away the dirt and give a soothing effect and in the long run preventing the irritation from spreading to further extents. The juice of this plant material is the most useful. It is extracted from the leaves and the extract has compounds camphor and thymol that have been shown to have the anti-itching properties. You would apply the extract on a daily basis to give you relief.